"The Celtic Knot of Infinity is a key -- the more you look into it, the more you see your path unfold." Are you ready to hit the road? Here's the perfect travel companion for any restless soul. Practical but charming, our Celtic Knot Tote is crafted from natural grey boiled wool - used by British travelers for centuries. 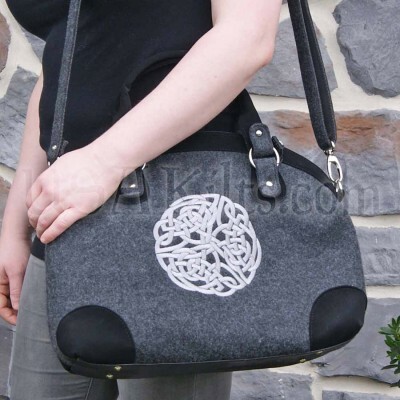 The magnificent Celtic infinity knot is embroidered in bright silver satin. Chromed steel double-zippers and hardware. Black faux-suede handles are comfy. Extendable removable shoulder strap stretches to 45". Reinforced bottom and corners for added durability. Satin interior features two handy open pockets and one zip pocket. Quick-access zip pocket on back. Measures about 15" x 12" x 6". Hand made in County Kerry, Ireland by Mucros Weavers.